What’s the latest comments that have come to this blog? This past week we had several comments received here. 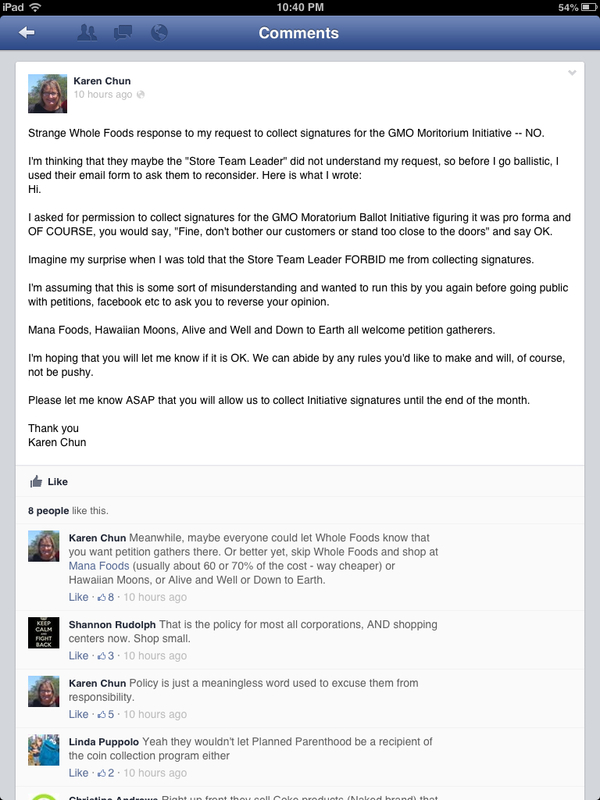 One commenter stated that she uses “solid science” to support her beliefs in why GMOs are bad. All of the ones provided ranged from the Bt in mother’s womb scare study which has been debunked to a bunch of other pesticide related ones. Note that in the citation for this article that the name GE Seralini appears as well as Criigen, both well known anti-GMO touters. To consider Seralini’s study as proof of anything isn’t going to convince me of these purported claims of danger. The state of Hawaii recently published some data on the health issues occurring on Kauai. 1. In general, cancer incidence on Kaua‘i was similar to or lower than that of the entire state of Hawai‘i. 2. Overall cancer incidence rates (all cancers combined) were significantly lower on Kaua‘i compared to the entire state of Hawai‘i for both time periods (2000-2004 and 2005-2009). 3. Cancer incidence rates on Kaua‘i were lower for the following cancers during one or both time periods: breast cancer (2000-2004 and 2005-2009), endometrial cancer (2005-2009), Hodgkin lymphoma (2005-2009), liver cancer (2005-2009), ovarian cancer (2000-2004 and 2005-2009), prostate cancer (2000-2004), and thyroid cancer (2000-2004 and 2005-2009). 4. The incidence of melanoma on Kaua‘i was significantly elevated for the time period 2000-2004. 5. Within individual census tracts of Kaua‘i, cancer incidence was generally lower or comparable to that of the state. 6. The incidence of melanoma for census tract 401 was significantly elevated for the time period 2000-2004. 7. No other census tract showed elevated rates of cancer. She also made a claim that birth defects are higher because of living near seed farm fields. In small populations as in a single city, the birth defects may appear higher but that may not reflect the entire picture of what is going on. The same issue was studied in another farming town in California, where there were issues of cancer clusters that showed higher rates of disease. However, when studied more closely there were no causal relationships to what was being seen. The data on that will likely be released soon by the state. Some of the defects that are being blamed include gastroschisis, polydactly, and anencephaly. 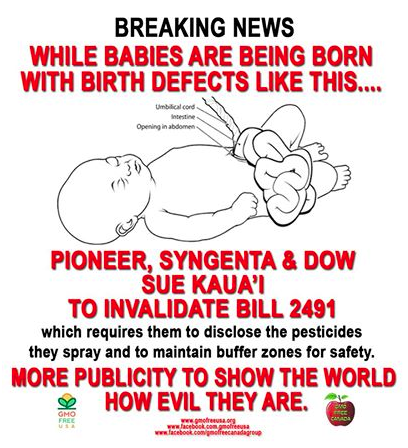 It is unfortunate that babies are born with these issues, however these defects have not been attributed to anyone specific factor or pesticides as many anti-GMO people claim. More research on these issues can be studied further as to understanding why it happens. So much for the first commenters issues with her studies and claims. Another commenter provided an invitation to be on the KKCR radio show. This show is led by well-known anti-GMO folks like Jimmy Trujillo and Felicia Cowden and from what I’ve heard, allows pro-GMO voices. However, their following is well trenched in the anti-GMO doctrine so, no, I will not allow myself to be skewered by such people. I already have been skewered by the anti-GMO club. From Helen Lovell tweeting that I’m a roach and Sara Jo Thompson giving me a nickname of Tokyo Rose, that shows me plenty right there that there will be no discussion. It will come down to name calling and shill accusations. It’s clear that this radio station rejects anyone who supports biotech as they didn’t invite a pro-biotech KIUC candidate to their show. Well, this commenter apparently does not know that this whole issue isn’t about being proud of what GMOs are and why people are fighting the misinformation campaign being pushed by the “right to know” crowd. No one is hiding any GMOs, we are fighting against the misinformation that people are stating against things. 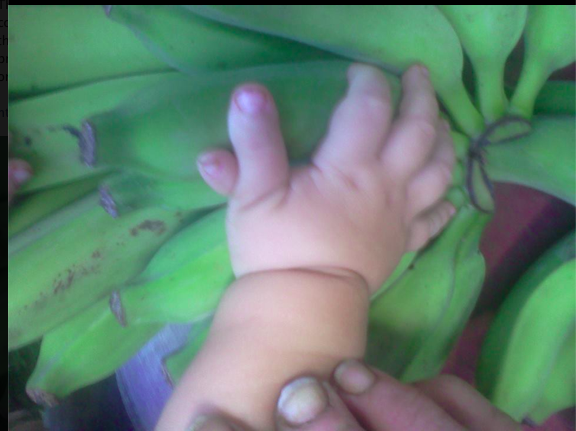 From what State Senate candidate Terez Amato said that she wants to educate me on those “thalidomide papayas,” to others stating that papayas are drenched with poisons, and so on. You know that if it isn’t labeled organic, that you can bet it has some GMOs in it. If you really want a label, please ask the organic industry executives to stop with the fear mongering or better yet, ask them to label their food as GMO free. The GMO label isn’t coming as soon as you like so go back to your preferred folks for some peace of mind. That’s today’s issues of things that the anti-GMO club says. We can’t end here however because the latest buzz on “whackosphere” sites right now is that, “There is Roundup and Atrazine in 75% of Air Samples!” It’s all over the place according to sites from Natural News to Green Med Info and so on. Don’t get your undies in a bunch just yet. The stuff being touted is cherry picked information to scare your skivvies off. Note that they haven’t tested for organic pesticides though. And hey, if you don’t want pesticides in the air, now might be a really good time to really look at GMOs. If we don’t want more pesticides being sprayed in the air, this might really be a better alternative. Did you know that 99% of pesticides are naturally occurring to begin with? This entry was posted in Research 101 on March 3, 2014 by hawaiifarmersdaughter. The author, Brittny Yap, attempts to make it sound like a balanced article by adding information from both sides of the issue which is seemingly fair. However, when you delve closer into what written in there, one who has a skeptical eye can see that she is far from being balanced with what is presented on the anti side. A member of the general public may just read portions of it and take it as fact. That’s where problems lie when people don’t know how to research what they read. A healthy dose of skepticism is a good thing to have that many should start to learn more about. Just because you openly state that you love science doesn’t count for beans by the way. Learn why your arguments learned from this article just don’t hold up. What worries a lot of people in Hawai‘i is that many of those seeds were created using genetic engineering: Taking a gene from one plant and putting it into another plant to create a new variety. By putting this statement in this article, the writer clearly shows that she does not have an understanding of basic genetics. All living things have shared genes with other species and DNA is not species specific. When one does not have a clue about genetics, this is a very common statement that starts to freak people out. What is important to know is that while we may share some genes with other species, how the genes function and turn on or off is what makes each organism unique. Just because a plant’s genes are crossed, it doesn’t automatically make a completely new species. GE doesn’t always mean crossing plants either as in the case of the seed industry. Learn more about GE crops before sharing a that stupid meme with a skull and crossbones on it and freaking yourself and others out. For a perspective of this, see the meme below and get an idea about why we can’t say that we only have human genes? Better yet, take a free course and actually learn a thing or two about basic genetics! 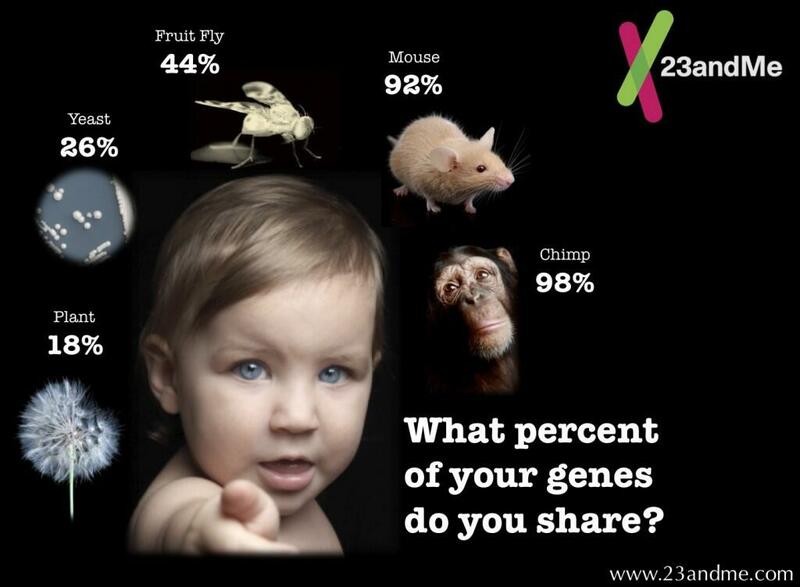 From 23andme.com meme about how genes are not species specific. But many consumers and activists are not convinced. They fear that unhealthy and dangerous products could enter the food supply via genetic engineering, that allergens could be transferred from one food to another and that GMO “super weeds” could overrun ecosystems. So the same people who don’t understand basic genetics and the driving reason for GE are the very ones who are suspicious. The black marketing scheme of the organic industry has a lot to do with this fear of the unknown. There is a considerable amount of research and testing done to satisfy regulatory processes to get GE food into the market. With the majority of the public having very little to no education on genetics and a basic science understanding, this kind of repeated statements turn into fact. The terminology used in the writer’s statement also point towards fear mongering tactics too. Foods containing GMOs are very common in America’s grocery stores today. The Center for Food Safety, an anti-GMO group, estimates that up to 85 percent of U.S. corn and 91 percent of soybeans are the products of GMO seeds. Biotech crops grown in the United States today also include cotton, canola, squash, papaya, alfalfa and sugar beet. “It has been estimated that upwards of 75 percent of processed foods on supermarket shelves – from soda to soup, crackers to condiments – contain genetically engineered ingredients,” says the Center for Food Safety. But consumers rarely know if they are consuming GMO products or not. It is interesting that the writer takes into consideration the Center for Food Safety as her source for GMO foods. Bill Freese, who is the CFS science policy analyst, apparently lectures about biotech issues but really appears to be overstepping his bounds with his claims. It is interesting that his BSc in Chemistry suddenly makes him an expert in biotechnology issues. He does not have any ag background either. This paragraph also conveniently forgets to mention the fact that when the GMO foods are processed in the case of sugar or oil, there is likely no have no DNA to be found. Nor do they explain that DNA itself is a very fragile molecule that is likely broken down when digested and processed. There is nary a mention either that the chemical composition of GE foods aren’t significantly different than conventional. Pomai Emsley is concerned about the spread of GMO foods. The 2002 graduate of Kamehameha Schools-Kapālama first learned about the subject while completing her bachelor’s degree at the University of Hawai‘i at Hilo and preparing to be a teacher. One of her professors set up a classroom debate about GMOs: half the students would argue for and half against. Emsley was among those assigned the pro argument. After weeks of researching the benefits of genetically modified crops, she decided to research the negatives to prepare for her rebuttal. Someone who is just completing a teaching degree’s opinion is in this article for what reason now? Okay, so she’s concerned about GMO foods “spreading.” How much education does she have to determine what is and isn’t black marketing strategies? She obviously does not know how to determine what is and isn’t vetted information as indicated by her second statement. Does someone being trained as a teacher have enough science to clearly figure out what is and isn’t factual? Not always. This is clearly an attempt to cast doubt of the unknown and target it with fear mongering. One reason Emsley and other anti-GMO advocates distrust Monsanto is its past. The 100-year-old company had been a leading producer of plastics, synthetic fabrics and dangerous chemicals such as DDT, PCBs and Agent Orange, a chemical weapon used by the U.S. military during the Vietnam War, which killed or injured about 400,000 people and caused an estimated half-million birth defects, according to the Vietnamese government. After a series of mergers and spinoffs, the chemical company’s sole focus became biotechnology by 2002. Now we know why Hawaii A’oles keep using these worn out old arguments about Monsanto’s past as a reason to distrust biotechnology. Note how the writer uses “dangerous chemicals.” She fails to do her own homework to know that DDT is still in use and has been approved for malaria control by the WHO. Malaria causing mosquitos have become resistant to pyrethrins and the benefit definitely outweighs the risk. Next argument she adds is the Agent Orange one and fails to mention the true toxin or the fact that the active ingredients are still sold today in hardware stores. The problem was the contaminant dioxin that caused problems and note that Monsanto didn’t spray it in Vietnam, the US government did so. As for PCB, it was made before Monsanto ever made it back in 1914. They did make it commercially in 1929 and it was eventually banned in 1979. The cancer links are inconclusive also at it is not listed as one of the causes of non-Hodgkin lymphomas. Another complaint about Monsanto is that it sues farmers who it says save some of their harvested seeds and reuse them to plant the next crop; Monsanto and other seed companies require buyers to sign an agreement that they will not harvest seeds to reuse. The writer is clearly not doing her homework when writing this. If she were to simply do some research in patent law as to why the seeds were legally covered as such in a contract, this statement would not be in this article. The seed is an innovation that is protected under patent law. Farmers who want to use this innovation must agree to the owner’s terms as written in a contract. If you understand basic genetics and want to ensure your crops, you wouldn’t want to save the seeds as the genetics change with each generation. You many not get the qualities you want with saved seeds because of hybridization. The seeds saved will not contain those hybrid qualities due to genetics. Think about why each year the garden shops have new packets of seeds. Even a gardener wants first generation of seeds with the best qualities in it to plant. Monsanto’s website says it has filed suit against farmers 145 times in the United States since 1997, mostly for patent infringement involving saved seed. Wood says this is a low number considering that Monsanto sells seed to more than 250,000 American farmers a year. Of those 145 it filed suit against, the company proceeded to trial against only 11 farmers, according to the company website. All cases have been found in Monsanto’s favor, including a unanimous decision by the U.S. Supreme Court in May. Another criticism of Monsanto is that it sues farmers whose non-Monsanto crops have been contaminated by pollen from neighboring Monsanto crops, or by seeds distributed by animals, winds or water. Brittny Yap really hasn’t done her homework once again with this paragraph. If you take a look at the actual court cases of the lawsuits against Monsanto, you can clearly see that this farmer wanted to use their technology without agreeing to a contract (see “Farming Practices” and “Testing of Fields” in the case). The writer does not mention that this farmer who was sued had 95-98% of his canola as Roundup ready, which doesn’t sound like an accidental contamination that he claimed. This guy admitted to using Roundup and knew that he had the technology, hence he got sued. There are other court cases that follow the same reasoning for Monsanto bringing upon a lawsuit against those trying to skirt around the agreement. Monsanto critics fear the company has too much power over the world’s food supply, with more and more farmers and consumers forced to pay Monsanto to grow food or eat it. They say the non-GMO seed options are diminishing every day and could eventually lead to a world in which Monsanto has control over who eats and who starves. There goes the conspiracy theorists and their corporations rule the world argument. This paragraph implies that farmers are “forced” to use Monsanto’s seeds which is blatantly false. If they have a good technology, that is a great reason why farmers want to buy their seeds. They do have choices as to what seeds they want to use in their crops. The widespread use of GM crops may also be encouraging a return to non-GM crops because of decreased pest pressure. 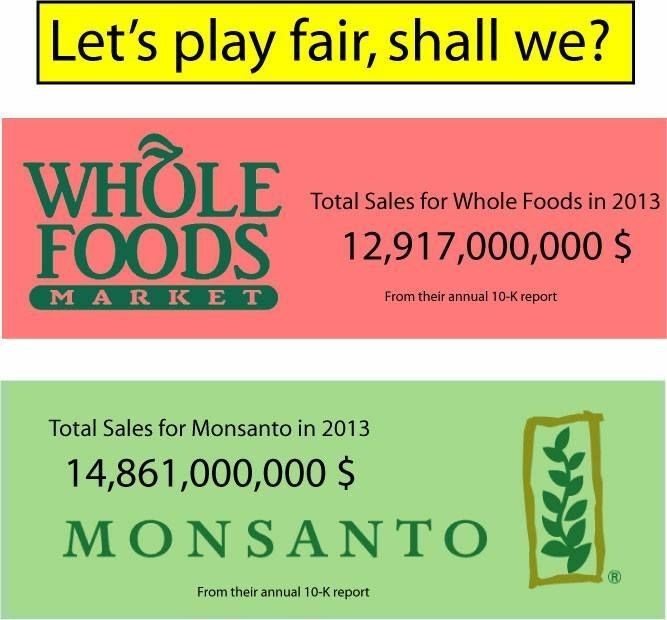 Putting profits into perspective with Monsanto and Whole Foods. If we really want to see which corporation is really making a lot of money, here’s an even better perspective that Monsanto isn’t as big as you think it is. 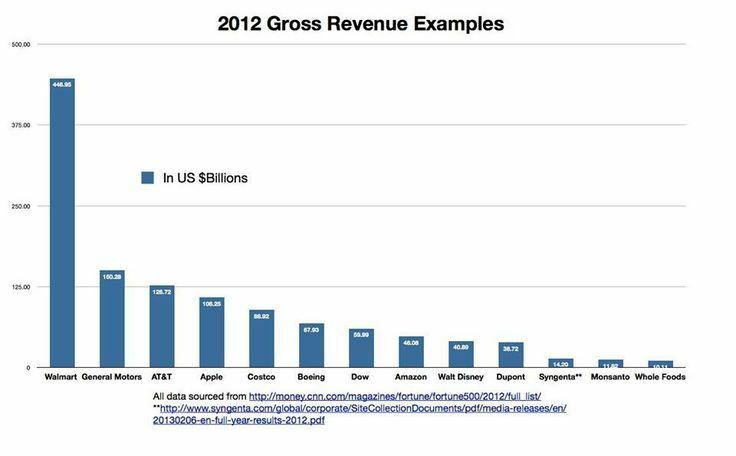 Which corporation is making the biggest profit and “ruling the world?” It isn’t what you’d think. 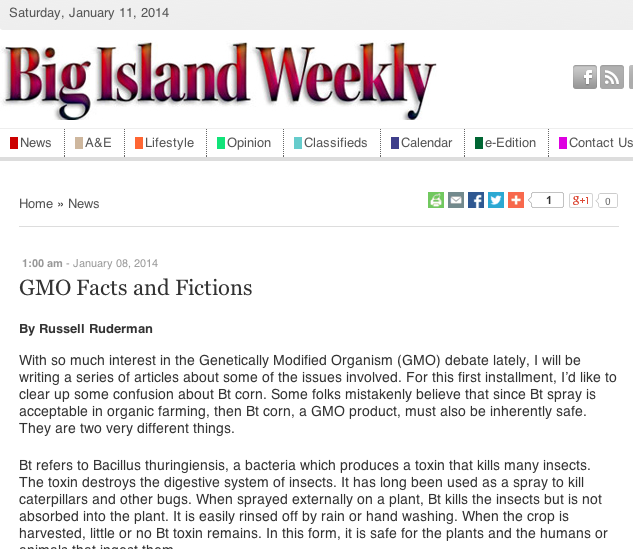 This entry was posted in Research 101 on January 12, 2014 by hawaiifarmersdaughter.